The turkey may be the star at your holiday dinner but the side dishes can steal the show - everyone has their particular favourite. Try this Roasted Squash with Lemon Tahini and Pomegranates or one of the 10 other veggie side dishes we showcase here! The holiday season is upon us and that means big dinners and family gatherings. And while the turkey may be the star of the show, don't forget that it's the side dishes that add the extra sparkle. Think about it... we all have a cherished side dish that must be on the menu come Christmas dinner. This year, let fall and winter produce shine with this very easy and beautiful Roasted Squash updated with a Lemon Tahini Sauce and Pomegranate Seeds created for us by Samantha at My Kitchen Love. And if you need more stunning and delicious side dish ideas we've got 10 more great ones for you to try from FBC Members across Canada down below. Fill half your plate with fruits and veggies this holiday season and you'll be one step ahead of all those healthy eating New Year's resolutions! Preheat oven to 400° F. Toss squash slices, olive oil, cumin, paprika, and salt and pepper in a large bowl. 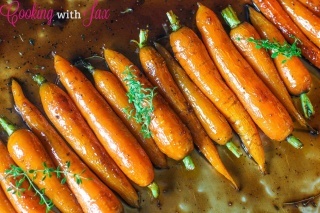 Spread out in a single layer on a lined (foil or parchment paper) baking sheet. Bake for 35-40 minutes until soft and golden brown in parts. To assemble place squash on a platter in a single layer and drizzle sauce over. Sprinkle with pomegranate seed and parsley.